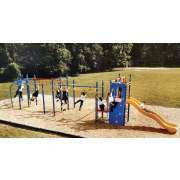 Shop Our Great Selection of Playground Sets & Accessories! 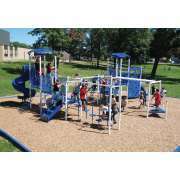 Playground sets must be safe, fun, and affordable to institutions on a tight budget. Where can you get a new playground for your school? All of the equipment that you see on this page was selected by Hertz Furniture because we believe your students will love it. 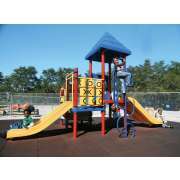 The commercial playground equipment in our collection has been designed with a high priority on safety and accessibility. Kids all over will agree that this stuff is serious fun. With ladders, climbing nets, monkey bars, and many other great innovations, our playgrounds provide kids with an exciting, healthy activity. How can you help kids be more active at recess? Recess and breaks are much more fun when there is some great equipment to play on. 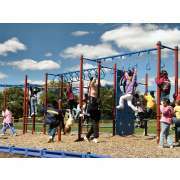 Not all children want to participate in games or sports, but a well-designed playground can offer a wide range of activities so all kids can find something that they want to climb up, slide down or run across. 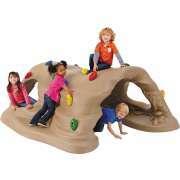 Great climbing equipment and interactive activities can keep children busy with independent or cooperative play. Recess is more than just play. When children climb, jump around and participate in games they are also developing important social and motor skills. Recess provides an opportunity for students to release their energy in a constructive and fun way, so they will be able to sit in class afterward and pay attention. 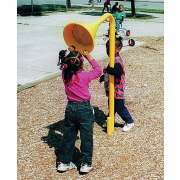 Better outdoor play equipment facilitates increased focus in the classroom. When children finally get the chance to run around outside, you want to make sure that they have lots of fun and enticing things to do. Our school playground equipment has a variety of activities and obstacles so everyone can choose something that they enjoy. When children have had enough of one particular thing, they can simply move on to something else. Additionally, if a child sees that something they want to play on is occupied, it will be easy for them to find a fun alternative. 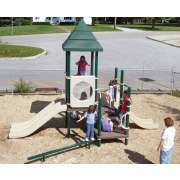 How do you choose school playground equipment? 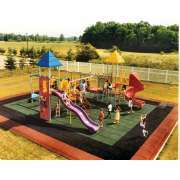 Depending on the amount of space you have in your play area, budget and how many children you need to occupy at a time, you can choose from our wide selection of kids playgrounds. 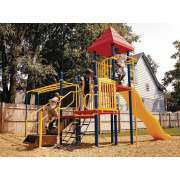 With swings, monkey bars, step ladders, slides, tunnels and balance beams, young learners will have a blast climbing, sliding and swinging across. How can you prevent fights on the playground? Even with lots of fun things to do, many children might gravitate toward the same activity. In order to prevent arguments and disputes on the playground, we even have an arrangement that is optimal for turn taking. 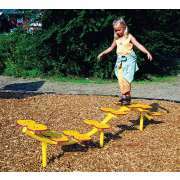 With a model that is designed as an obstacle course, children can wait their turns and be encouraged to try a number of different challenges that will help them develop various motor skills. Children can make up their own challenges, time each other or come up with original games as well. How can I ensure that my playground is the right size for my students? 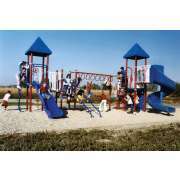 When choosing school or daycare playground sets, it is important to make sure that your choices are age-appropriate. When equipment is the wrong size, children will require help to use it and are not as safe as they should be. 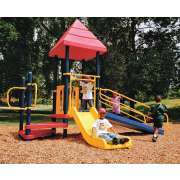 Our school playground selection includes models that are appropriate for early childhood education through early adolescence. With so many choices, you can easily find a number of great options no matter how old your students are. Make sure to check that your selection fits the ages of your students. How many children can fit on the playground? 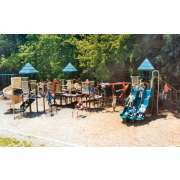 An additional concern that should be taken into consideration before any play equipment is purchased is how many students can play at one time. There is nothing more frustrating to a child than getting to recess a few minutes late and realizing that there is no room on the playground. 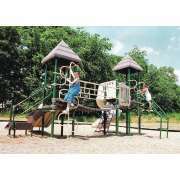 In order to enable all children to play, you want to make sure that your play ground can accommodate as many children as you have outside at once. We have playgrounds of all sizes so you can fit a few students, a whole class, or a number of grades and everyone can play together. Do you have wheelchair-accessible playgrounds? Every student in your school or daycare should have equal access to the play ground. 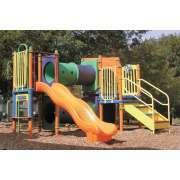 Make sure all children can play together for many years with ADA accessible play equipment. 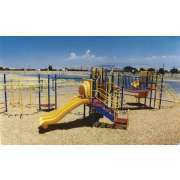 Our playground equipment from Kidstuff Play Systems and UltraPlay is built to withstand all kinds of weather. It will function well and look great for the long term so children can enjoy outdoor play for a long time. 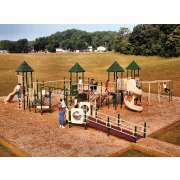 Give every child something to look forward to at recess with great playgrounds from Hertz Furniture. 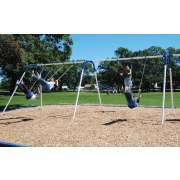 Our huge selection of playground equipment will provide years of safe fun for the children in your church, daycare or school.